You’ve subscribed to Studio LB, you’ve texted the hotline, you’ve checked your email and the facebook group to see what’s in store for you this week, you have your leggings and sports bra laid out and ready to go, and your alarm is set (ok… your 6 iPhone alarms spaced exactly 4 minutes apart are set). You’ve totally got this. But then something in your brain stops you from getting up and getting moving with me. While you know that exercise will ultimately make your day feel complete, often you’ll face mental blocks that stop you from getting your sweat on, and you literally have to make room for your practice in your life for it to actually happen. Here’s a few tips for manifesting your at-home practice. Lets make it happen! So, you really want this, right? You have to believe in you, your practice, and the results that are coming your way, but you also have to work with the universe to facilitate receiving. It won’t happen overnight, but if you’re diligent with taking action you should be all in within 30 days. Maybe carving out a corner of your bedroom so you can literally roll out of bed onto the mat and start stretching is best for you. 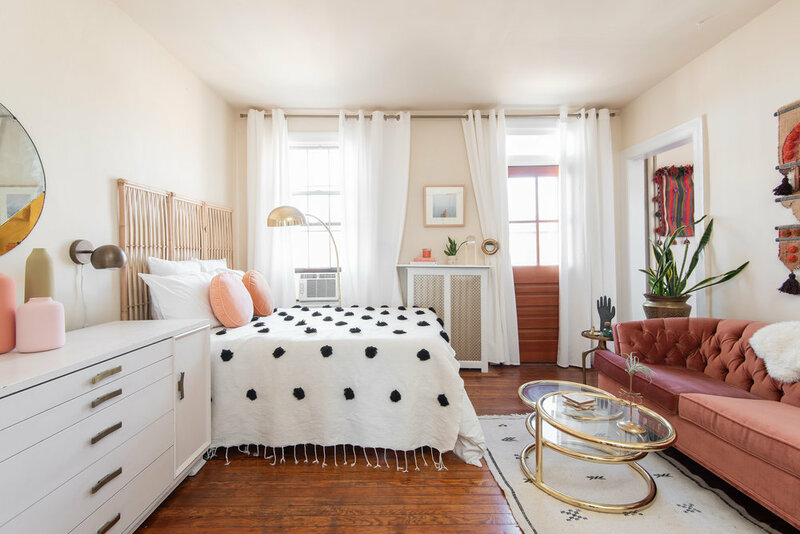 Or perhaps your bedroom is solely a sleeping sanctuary and you prefer the biggest screen in the living room with the coffee table pushed out of the way as your at-home studio. Whether it’s your bedroom’s natural light that motivates you, or you prefer to have a spot for your little one to safely play while you do CCS, ask yourself what type of environment will be most conducive to your performance. Once you’ve determined this, stick with it and make it your spot moving forward. In each of my workouts, I’ll list in the notes what you need for equipment like light or heavy weights, a mat, loops, or nothing at all. Making sure you have the necessary accessories before pressing play means you won’t have to pause and run around the house searching for your gear mid-workout. I also cannot stress enough how important it is to have a full-length mirror to the right or left of your screen so that you can check your form. Try not to speak poorly of yourself, your life, or your body. Never say, “I’m not good at this,” or “I can’t exercise at home”. These negative phrases should not exist in your world. Of course, you want to master each move on your first go around, but that’s not realistic. Don’t get frustrated if you make a mistake during a cardio sequence during the breakdown. I make mistakes too! A fear of failure can hold you back from making huge physical and mental gains using my program. Keep moving, keep trying, and trust that change will happen when you’re a little outside of your comfort zone. Last but definitely not least, I’m here for you to answer any questions or jut to give a morale boost, and I truly want to see you succeed. Text me and the team on the Studio LB hotline 424-327-5470 with any questions or feedback! We’re kicking-off a new month on Monday, April 1st! Your overwhelming response from International Women’s Day has inspired us to look within our community and recognize some insanely talented Studio LB members here on the blog. First up, we wanted to share a recent Q & A with Linny Giffin, a Studio LB member and multidisciplinary artist living and working in Washington, D.C. 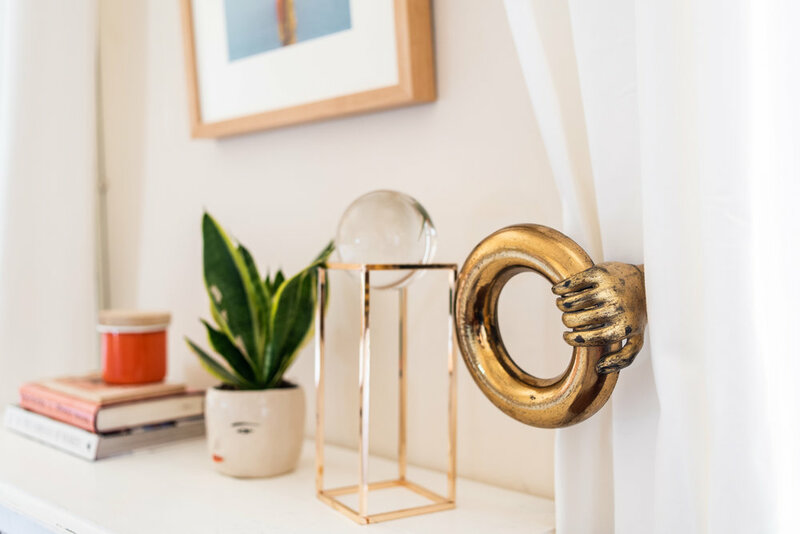 Seeing her creativity and and ability to balance form and function in her space, we needed to know more about what drives Linny in her work, her home and her health. Can you tell us about your work as a fiber artist and about The Lemon Collective? As a fiber artist, I do a lot of work with embroidery, weaving, quilting and soft sculpture. I've translated the medium to large scale installation art, creating bespoke pieces for restaurants and homes in D.C. and beyond. Last year I created a loom on the storefront of my studio and wove flowers through it, I called in the Living Loom. In 2015, I co-founded The Lemon Collective with two other D.C.-based artists. It originally started as an art studio for us, but quickly morphed into much more. Now, it is more of a brand and creative community that celebrates artists across a range of mediums in a city where creativity isn't always a priority. Our brick and mortar hosts workshops and other events, providing a space for small business owners to exhibit their expertise in anything from jewelry making and flower arranging to embroidery and business development. We're building an online community that connects artists and celebrates the importance of creativity. 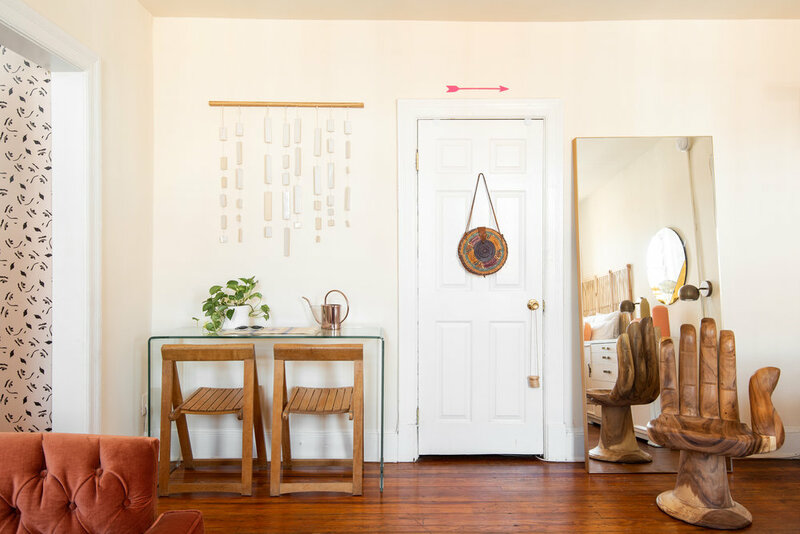 You live and work in a 350 square foot space in Washington, D.C. In what ways do you find this space limiting or liberating? Of course, living and working in a 350 square foot apartment is extremely limiting. However, just by opening up the door to my fire escape, I feel a part of the city. The view is amazing and I live on the best street in D.C., there are cafes, restaurants, shops and an independent movie theater right outside my front door. Plus, the small space allowed me to design the apartment very intentionally so no square foot was left neglected. I think that makes the apartment feel liberating. Do you practice Studio LB at home or elsewhere? I practice at home! I just roll out my mat in the middle of my living room floor. One of the many things I love about Studio LB is it doesn't require equipment and I can do it anywhere even my tiny apartment. Linny is currently working on an outdoor installation series around D.C. and Northern Virginia, and you can find her on instagram at @linnyfriend and online at https://www.linnyinc.com. To sign up for the Lemon Collective’s monthly newsletter for news and goings-on in the art world, visit https://www.wearethelemoncollective.com.